U.S. Defense Secretary James Mattis discussed peace process as he met with Afghan leaders during a surprise visit to Kabul on Friday. Mattis was accompanied by Chairman of the Joint Chiefs of Staff General Joseph Dunford, who on Wednesday travelled to Islamabad along with Secretary of State Mike Pompeo. In Kabul, the U.S. officials met with Afghan President Ashraf Ghani and Chief Executive Abdullah Abdullah in presidential palace, where they discussed peace process, positive impact of the South Asia strategy, reforms in the Afghan National Defense and Security Forces (ANDSF), upcoming parliamentary and presidential elections, counter terrorism and dialogue with Pakistan, Ghani’s office said in a statement. Before visiting Kabul, Mattis said he was hopeful about peace talks with the Taliban. “Right now, we have more indications that reconciliation is no longer just a shimmer out there, no longer just a mirage,” Mattis said. “It now has some framework, there’s some open lines of communication,” he added. Meanwhile, Dunford reiterated that the Taliban cannot win on the battlefield and that they mush engage in a peace process. 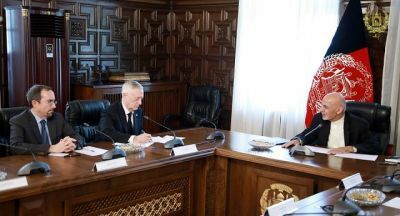 During the meeting, Mattis reaffirmed that his country would continue to support Afghanistan until it achieves stability. He said that the U.S. would continue to support Afghanistan in the areas of security and economy. For his part, Ghani said that the Afghans want peace and enduring stability and thanked the U.S. for its support.